The care administration function makes the TakeCare a full-scale PAS system. As this function is fully integrated with the rest of the system, the user logs in to only one system, not several. In addition, the information is easily accessible in the patient’s medical records. This function manages the administrative process from hospitalisation to discharge. 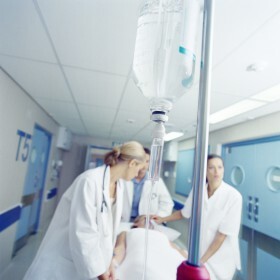 At the time of hospitalisation, the function manages the entering of various hospitalisation information such as hospitalisation code, patient charge, etc. During the period of hospitalisation, there are functions for handling the transfer and deployment of the patient, as well as permissions. At the time of discharge, the function handles discharge information such as the cause of discharge, the time and date of discharge, etc. Each hospitalisation procedure creates a care pathway in the care contact overview in the patient’s medical records. A separate online report makes it possible for reception staff to view all hospitalised patients. The occupation report makes it possible to manage the utilisation of resources at all care units in the system. The report is used by consultant doctors to get an overview of where vacant beds are located, the number of patients scheduled for discharge, and the number of patients scheduled for hospitalisation. The funding system is designed to be able to manage different types of patient appointments with or without a charge for the patient – in accordance with current rules and regulations. It is also possible to manage external payers, such as insurance companies and other county councils. Each funding registration creates an appointment in the care contact overview in the patient’s records. This function is used for the administrative registration of diagnoses if the reimbursement system DRG (diagnosis-related groups) is used. It is also possible to use this function to record operation codes, action codes, product codes and supplementary debiting. All care contacts automatically end up in the function while awaiting registration. The component communicates with DRG groups which provide information about DRG priority, days of extended care, etc. The care-administration components can be integrated with an accounting system, and book-keeping transactions can be sent to these components online or in batches.